Hi ya! School holidays is just around the corner. Have you planned wanna go where? 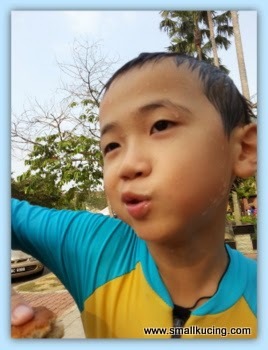 For me of course I wanna go to play water la. Hot days ahead leh. 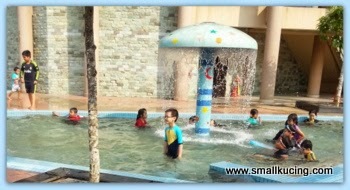 Last school holiday, we found another free paddling pool in Putrajaya. This time it's at Precinct 9. 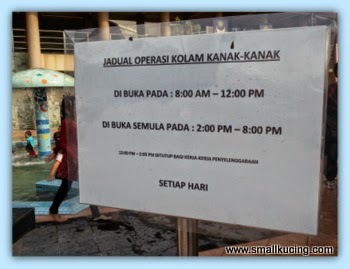 The above are the operation hours. Quite big. Think it's bigger than the one we went to at Precinct 2. But the water was not that clear la. 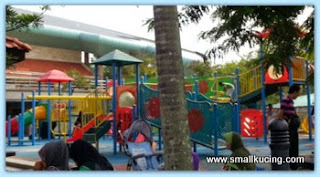 Next to it, a playground. But most kids seems to prefer water instead. Right opposite of the Paddling Pool , a food court. 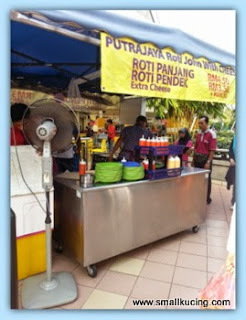 Loads of good food there but this Roti john attracted Mamarazzi's attention. Full of yummylicious meat, egg, vege and mayo. Of course I came running from the pool when I sense that there is good food around. Before I zoomed back to the pool. Yippee ya yay ! Yippee ya yoh! Here I come! All this running around sure had me famished. 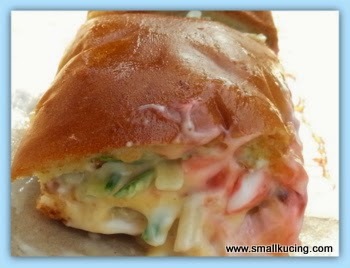 Bodek-ed Mamarazzi to buy me one more of the Roti John. Yum! delicious. ... I remember how hungry swimming used to make me, hmmm, that sandwich looks good ... but don't forget to drink lots of water too, lil kitten, yes? ... and enjoy your time off school ... Love, cat. I can see you are enjoying yourself and having great fun at the pool. Did you make any new friends there? Always hungry after swimming or playing! Wahhhh!!! Got lunch break one kah? Anyway, too hot to play in the sun, later heat stroke. used up a lot of energy lo. 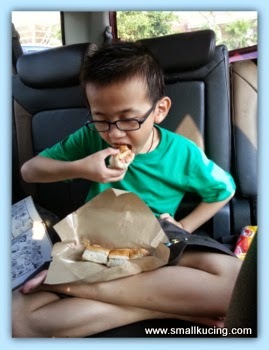 Wah, you good ler, school holidays go play water.. For us, school holidays means normal only.. Kz still goes to daycare as usual, and we still go to work as usual.. Yummzz, I saw that roti John leh, looks so loaded with mayo and stuff, I want !! Not sure is it the same pool. Huh, haven't even wipe and dry your body already start eating...later get cold argh...next time wrap a towel around first. 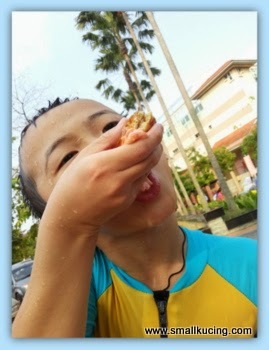 Aiyo I really like how you can EAT. 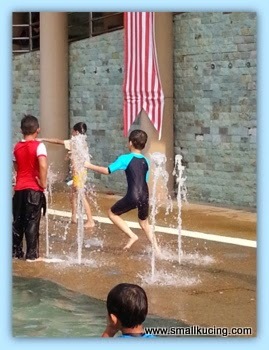 What a fun time to splash in the pools of water! Lucky boy! 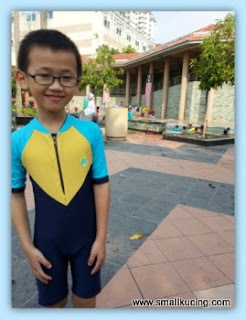 Anay hardly had pools to swim at your age. Eh the Roti Panjang and Roti Pendek names got me laughing! It is so funny. 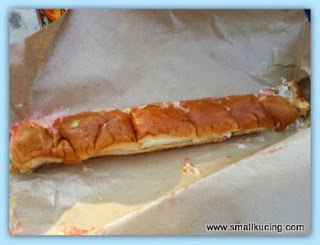 I only tried eating Roti John many times. That sure is a fun way to spend your holidays!! The Roti John looks good leh. So far I haven't eaten this sandwich before. Wow! so nice the pool. Didn't know it existed. Great food too to saviour. My boys would like that paddling. And the food looks great too! He certainly enjoyed his time! What an enjoyable day for the kucing! Love the roti john! Sate kajang, ymm. But I haven't tried yet. The kids here will be getting out of school for the summer as well.